The early 19th century was the period from about 1800 to 1840, and it happened in Spain as well as several other countries. At that time it was usual for most people to have an everyday life. All cities were limited by a medieval wall, and the principal doors of the outskirts of villages were closed at night. 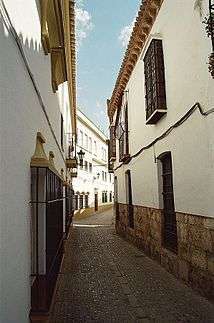 City streets were narrow, irregular, and most of the time, they were blocked by a house’s garden. Also they were made of small stones and without sidewalks and it was very regular to see: cats, dogs, donkeys, pigs, ducks, rats, hens… walking along them. The streets were the places where people used to throw waste and dirt out of their windows as well as also being somewhere a lot of people used to work every day, especially the street cleaners. In March 1840 they started thinking about a way to maintain the streets as clean as possible and the principal cities published their "Urban Police Rules" (Reglas de Policía Urbana) which said how the citizens should take care of all the public stuff. Thanks to this, almost all the cities started putting into practice those rules, so renovated walkways and public conveniences were built to improve the quality of the cities. At night people used to break into their houses because there was no lighting, so the Urban Police Rules recommended painting the entrance of the houses purple. This made it easier to find the front door. Little by little the cities improved on their appearance and the citizens had a better way of living. Not many people lived in the countryside any more, because of the wars, which made it unsafe. Rich people had many privileges but there were others who just had a simpler house with the main things to survive. Houses were divided into three or more floors. The first floor was used as a gallery or as a workshop. The one above was where the proprietary lived. It was the most spacious and brightest one amongst all of them and where the bedrooms were located. The other floors were usually bedrooms where the owner of the house’s family used to live before they died. Nobody came there afterwards because of the smell. The terrace was controlled by a man who knew the family really well and had a good relationship with them. He was in charge of reading the posts and controlling who enters and exits the house amongst other things. The living room was big with two or more balconies; spacious and the perfect place for meetings. The walls were upholstered in soft colours, decorated with gold mirrors and with portraits of the family. Also there were big sofas and armchairs. At that time, people were usually worried a lot about their appearance and did not take care of their personal hygiene. They cleaned their hands, face and brushed their teeth everyday but their feet, just once or twice a month. The most elegant men shaved their beard every day, the more careful ones, two or three times a week and the rustics, once a week, except during Lent. They used water, soap, blowtorches, and knives. Despite the fact that doctor’s recommendations said that everyone should take a bath at least once a week, no one used to do it due to the lack of an appropriate room for it and money. Men were always into fashion and usually all their conversations were about that. To make their dresses, cotton, wool and silk were essential, and their quality was extremely good. Trousers were replaced by underwear till the knees and men wore tight trousers and braces. Shirts were made of cotton or linen. Ties were a fundamental accessory, especially for women and children. They introduced the use of the vest which had a lot of colours, tights which reach the knees and socks that were made of cotton. Also they wore overshoes, large coats and top-hats. During the early 19th century, women’s fashion underwent some transformations. They started wearing corsets, shape wears... They used ankle boots and when they went shopping they covered their heads with feathers or thongs. Also they had gloves, shawls and fans. They wore gold jewels for important events. Each moment required a specific dress and a special hairstyle. Feeding evolved during that period thanks to the French influence. Generally four meals per day were made: breakfast (desayuno), brunch (almuerzo), lunch (merienda), and dinner (cena). Breakfast was eaten after waking up and consisted of chocolate and bread. During the 19th century brunch was delayed so that it was taken later—between 1 and 3 p.m. For lunch the traditional dish in Madrid was cocido which consists of chickpeas, vegetables, potatoes, bacon, meat, sausages, salt and oil. In bourgeoisie families beef and pork were very common. A fish was eaten at night. The farmers and their families ate soup with oil or bread, but also they took advantage of what they cultivated. During the second half of the 19th century, French gastronomy was introduced into Spain, so new ways of presenting the dishes were established. By the end of this century gastronomy was all in the rage. Some books of recipes were published and a few people was interested in them. When children were born, they dressed themselves with diapers and cotton shirts. In winter they were wrapped with a coat which covered all their body, and in summer with a shawl. Their heads were covered with three different caps, and their beds had to be done with a mattress oats, they were easy to change and very cheap. Teenagers studied to find a good job, and they were very into religion since they were little kids. Girls did not go out of their houses if their mothers were not with them. And when a boy wanted to conquer a girl he followed her to her house, then he gave a letter with a romantic message to her servant so that the girl could read it. The best moments to talk to the girl you liked were during mass. But until the boy could come to her house, he had to pass an exam in which the family asked a lot of questions. After that, both of them went to a notary to sign the marriage, and when the wedding was celebrated, the husband was able to spend time with his wife. When women became housewives, they were in charge of ruling and organise the servant’s work, take care of their children and organise their homes. They must spend most of the time with their children usually when they could not be self-sufficient. Men had the absolute power above children, women, and animals. Like the servants, they were in charge of controlling the people who enter and exit the house and of course his wife (especially the wife). They usually had an office were they spent a lot of time.